Transportation Costs > Boats and Watercrafts > How Much Does a Boat Anchor Cost? How Much Does a Boat Anchor Cost? An anchor can come in many different designs, shapes and weights, but each one works in the same way. One end of the rope or chain can be connected to the anchor, while the other end is connected to the boat. Once the anchor is down, it will use its shape and design to dig into the bottom of the water so the boat cannot move. The size of the anchor you need will depend on the environmental conditions and the size of your boat. The cost of a boat anchor will depend on the style, type, the material it’s made from and where it’s purchased from. On average, smaller anchors designed for small fishing boats can cost anywhere from $10 to as much as $35, while larger anchors designed for vessels that travel in rougher waters, can range anywhere from $500 to as much as $2,000. Refer to our table below to see what the average anchor can cost for most leisure boats. Granted, these costs can be much higher if it were needed for a freighter or larger shipping vessel. Fluke A fluke anchor will work best in loose terrain since it's designed to bury itself when lowered, essentially putting itself out of view. Even though these anchors don't weigh much, it's the "flukes" that hold the anchor to the bottom. This anchor won't work well in rocky terrain as it can sometimes become stuck, making it hard for it to become free. When you buy an anchor, you will need to purchase additional materials such as anchor rope and clips which you can use to fasten the anchor to the rope and the vessel. Some kits can come with the rope, but some people prefer to purchase a more durable rope. 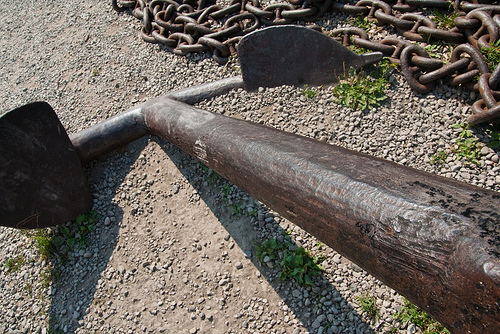 On a smaller boat, the anchor is usually just let down and raised up by hand. However, there are electric winches, as stated in our table description, available that can help you let down and lift the anchor without as much effort. These devices will also prevent the ropes from getting tangled. Automatic lifts that lift the anchor for you can vary anywhere from $100 to $300 for a smaller anchor size. Larger lifts can cost significantly more. Anchors are commonly made from galvanized stainless steel and will have different designs which can be useful for various types of sea vessels and situations. Smaller boats will have anchors that range anywhere from one to five pounds, while larger boats can anchors that weigh more than 30 to 100 pounds. Oil rigs and freighters will use anchors that weigh up to 50,000 pounds. Before you buy an anchor, you will need to do some research and determine the right anchor for the type of boat you will be using it. You do not want to get something too heavy nor do you want to get something that is too small. Smaller boats that are smaller than 15 feet, for example, should have an anchor that weighs at least three pounds. According to Bass Pro, the anchor you choose should hold well on all types of bottoms, can be set and re-set quickly, have good holding power, can be released easy and stored easily on the boat. As for choosing, they say it can be a “guessing” game since the conditions are always changing and you shouldn’t choose an anchor based on its size. Instead, it’s best to focus on the physical size as this can be a good indicator of a solid boat anchor. You can purchase anchors from many different stores online, and most differ with their prices. Check out Google Shopping or even Amazon to compare prices. Anchors can also be purchased used. Because of the durability metal and steel offers, anchors can last a very long time. Even if there is a little bit of rust, the anchor will continue to work. Check on sites such as eBay and Craigslist to see if you can find a used anchor.